Miamai is in Lazy Sunday and we have selected four gorgeous heels and discounted them to 75L. These heels are only discounted from 12AM until 11:59PM Sunday the 4th of October! Only at the Miamai Main Store! WOW: Miamai Exclusive Special Edition Shoes 2 pairs for the price of 1, never to be sold again! WHAT SHOES: Folder Wedges Opti in OptiBlack and Folder Wedges Opti in Optipur! 21SHOE, 1 day, 24 hours, shoe addiction therapy. At 12:01 SLT on January 21ST the January round of 21Shoe starts! For 1 day MIAMAI has 2 exclusive pairs of the Folder Wedges Opti on sale for the price of 1! Make sure you hurry though because once the clock strikes 12:00 am January 22 the sale is over and these shoes go away, forever! Artistic and avant guard, the perfect addition to your cutting edge styling the Folder Wedges Opti bridge the line between fashion and art, beauty and pain, The Folder Wedges Opti are amazingly detailed, 100% original mesh, and materials. These two exclusive colors Optiblack and Optipur are only available for 24 hours at 21Shoe! *Note: Folder Wedges Opti in OptiBlack and Folder Wedges Opti in Optipur will not be available for purchase after January 21st 2015. If you miss this chance you will miss these shoes. For the full list of participating stores join the 21Shoe Official Group in SecondLife. All Miamai Slink AddOn shoes require the purchase of the compatible Slink mesh feet from Slink. Please try the demo before purchase. As the items are no transfer we are unable to provide refunds. WHAT SHOES: Intollerance in Rose and Reagan Pumps in Shades of Red! 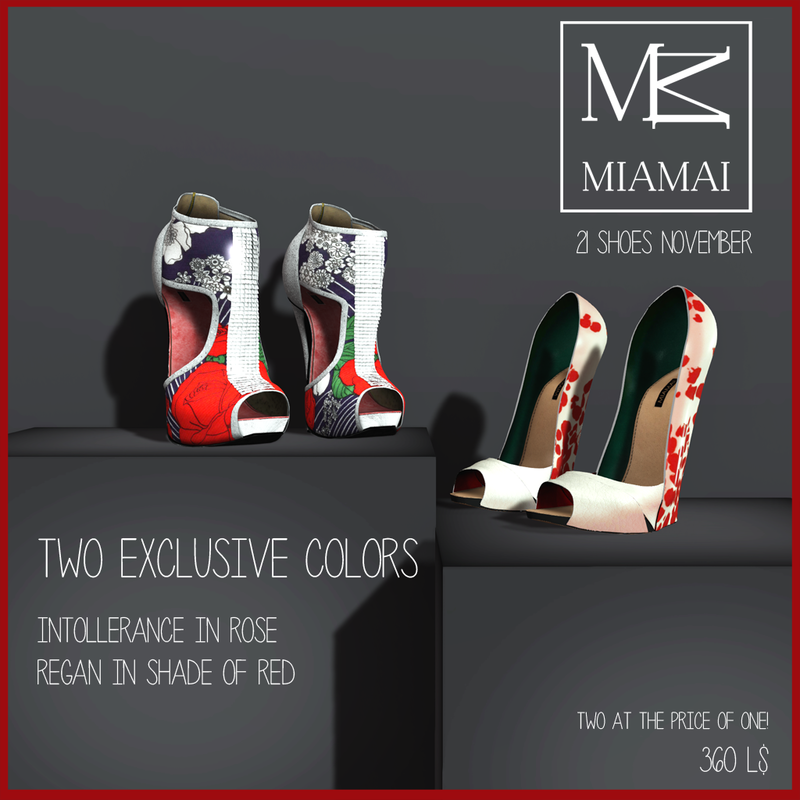 *Note: Intollerance in Rose and Reagan Pumps in Shade of Red will not be available for purchase after November 21st 2014. If you miss this chance you will miss these shoes. For the full list of participating stores join the Shoe21 Event Official Group in SecondLife. All Miamai Slink AddOn shoes require the purchase of the compatible Slink mesh feet from Slink. Please try the demo before purchase. As the items are no transfer we are unable to provide refunds. WHAT SHOES: Indifference in Infinity and Reagan Pumps in Dispersion! *Note: Indifference in Infinity and Reagan Pumps in Dispersion will not be available for purchase after September 21st 2014. If you miss this chance you will miss these shoes. For the full list of participating stores join the Shoe21 Event Update Group in SecondLife. WHAT SHOES: Intollerance in Macula and Curiosity in Reddish! *Note: Intollerance in Macula and Curiosity in Reddish will not be available for purchase after June 21st 2014. If you miss this chance you will miss these shoes. 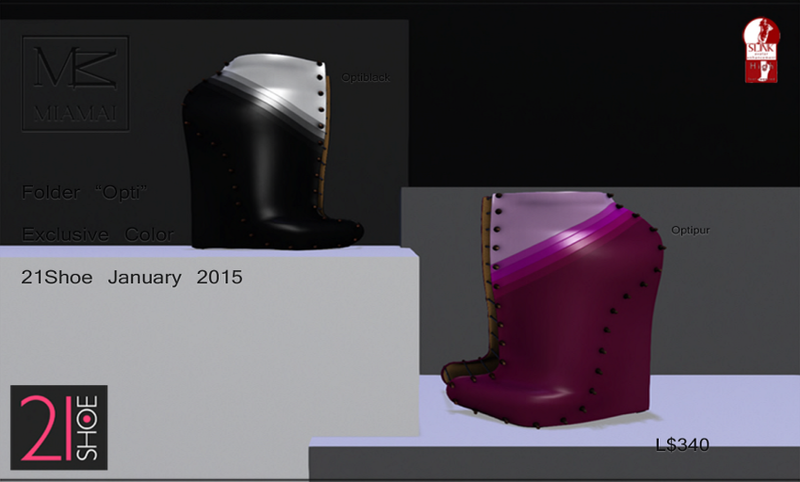 For the full list of participating stores join the Shoe21 Event Update Group in SecondLife.